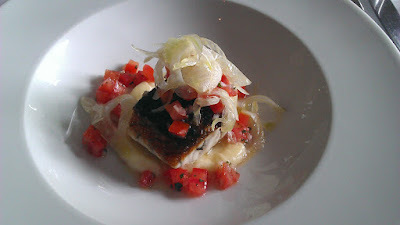 The first thing I will say about this post is that it seems that the trend has changed in Sydney restaurants. Once you couldn't get a booking for love or money on a Monday night, and now it seems Sunday is the day of rest. The restaurants we had originally picked out for my birthday dinner were not bookable and so it was further afield I looked, The Cut didn't disappoint. 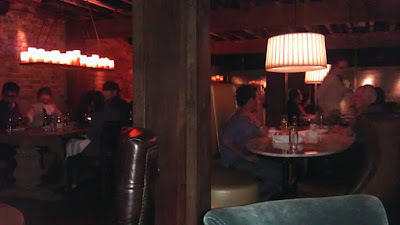 Sadly the ambient lighting while well suited to the environment didn't take the best picture on my camera without a flash, but the heavy wood furniture and throne style chairs were perfectly suited to the type of restaurant. Also note the group tables perfect for a family or work dinner for 8-10. 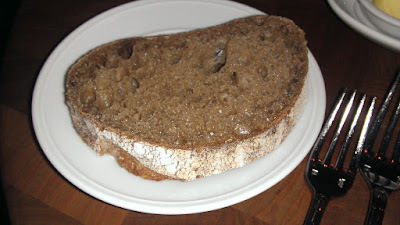 Good simple bread, the oil was fresh and excellent, worth a dip. Stupidly I forgot to take pictures of the wine, this is actually one of my favourite non French sparkling wines if you see it on a menu choose this over another tired Champagne. Crisp lively and fresh it lacks the heavy toasty of some Champagnes but is an excellent drop in the Southern Summer. 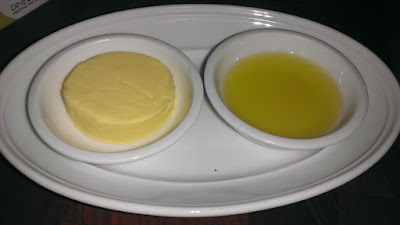 The liver pate itself was very well done, not strong on alcohol flavouring as I prefer but smooth and heavy. Despite the pate itself being excellent the accompaniments let it down. Liver parfait is best served with a sticky sweet accompaniment, the cleansing sorbet neither accompanied or cut through the fat it just sort of... melted away leaving too clean a taste behind. 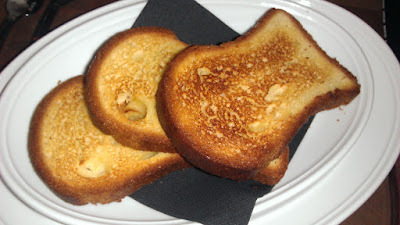 The brioche too seemed dry and rather stale, if they make it in house I will be shocked. If you want great pate go to Danks St Depot or Glass, this is good but the sides are not worth it. 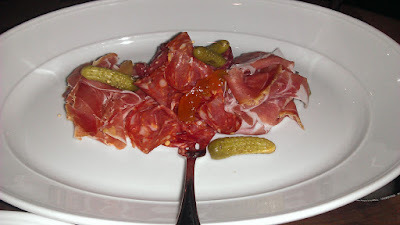 Prosciutto di San Danielle, Calabrese Salami and Papandrea Fennel Sopressa served with candied mustard fruit and plenty of cornichons. I would have preferred the wait staff to realise that we needed more than 1 slice of bread to get through this pile of meat though. Usually I like a granache with a steak but the choices we'd made had me hanker for something different. 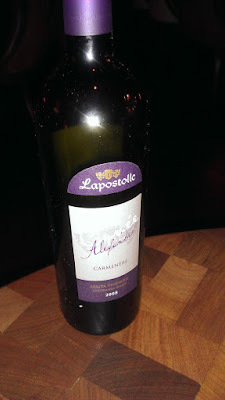 This is a smooth and fruity wine with a freshness familiar to those who like new world wine and the Carménère should be enjoyed by those who like Cabernet. All prepared to eat his usual dish of grass fed rib eye my partner was distracted by a waiter bearing very shiney things: a side of slow roasted 7 score marbled wagyu. The waiter was kindly enough to give an honest answer on the richness of the food and the serving size that should be ordered. This 400g piece was far too much for my food loving other half, I would suggest instead ordering a 300g ($42) for most. With a similarly excellent salt crust and moist melt in your mouth fatty richness, the rendered fat simply oozing juices from the meat left a very happy boy wishing he could fit more in. This is probably the best steak I've eaten in Sydney. Grilled to absolute perfection with a crisp caramelised crust, salted just enough, the dark crust hides a perfect medium rare steak. 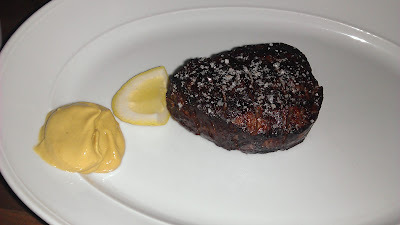 The aged grain fed fillet was tender and the knife slide right through it, this is a steak to savour. 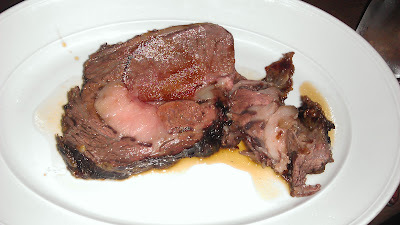 I ate it simply with a little lemon and some dijon mustard, the meat is good enough not to require a sauce. 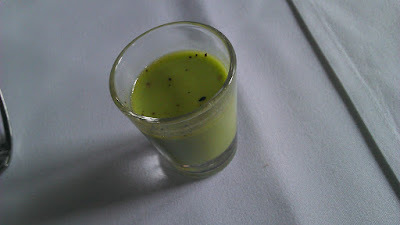 Veal jus came with it but was not more exciting than a similar jus at any good steak grill. I will come back for this steak alone, perfectly seasoned, perfectly cooked, perfectly rested, excellent aged meat treated the way it should be. We have learnt not to order rich sides with this kind of meat any more, it goes to waste and leaves us beyond ill. 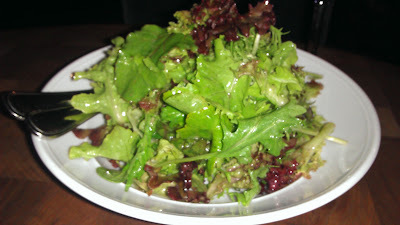 Instead salads, for the boy a mixed leaf salad, nothing special but well done. 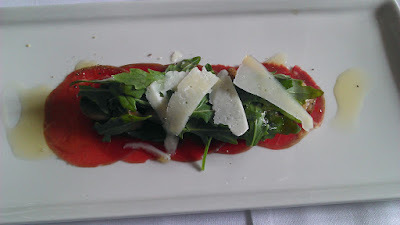 Now I like a salad with a bit of difference and this was one fantastic salad. 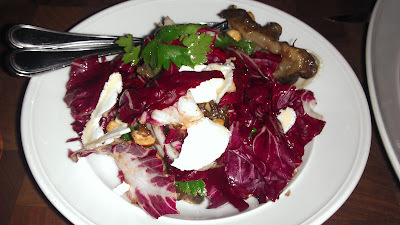 The radicchio had a bitter crispness that really cut through the rich meat, Jerusalem artichokes are quite frankly excellent with everything and pattered with roasted nuts and slices of a mild goats cheese? 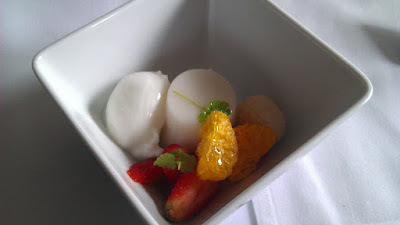 Just perfect and a great accompaniment in summer. 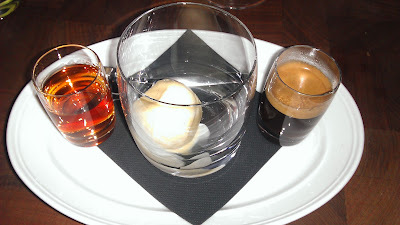 To be honest the desserts left me a little cold so instead an affogato, Amaretto for preference. A small serve of rich real vanilla bean ice cream with very good quality ristretto makes me suspect their patissier has an Italian bent. Well done and a suitable end to the meal without being cloying. Take note aspiring chefs this is a supreme lesson in editing your food. What could have been simply a well done de-constructed lemon meringue pie obviously wasn't considered fancy enough for the menu. 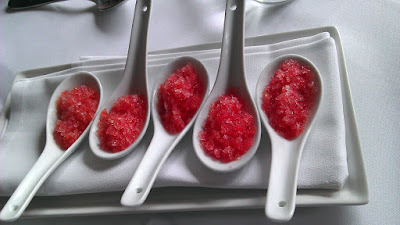 The Rose Geranium Pebbles were essentially a salted flower caviar gelee that had no purpose on the plate and frankly was a confusing and unnecessary addition that once tried was avoided. 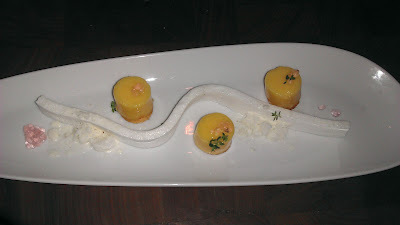 The texture alone was off putting let alone the salt, stop over thinking things and just leave a good dessert alone. I'm not sure if The Cut is still trying to find its feet, there were some absolutely perfect pieces like the salad and meat with some confusing dashes around it like the brioche and the salted mess on dessert. What it does well though is its core business: great quality steak and sides. Most of the serving staff were good but unfortunately I got the impression that our waiter doesn't like his job. He served out food like a silver service waiter but forgot to tell us about the charcuterie, interrupted our entrée to show me the wine for the next course when we had clearly just been served sparkling, looked miserable the whole time and couldn't make a suggestion about the desserts. Perhaps he wasn't meant to work a Sunday shift, I don't know, but perhaps one less waiter would have been a better experience than a bored one not interested in the food. Nonetheless I'll be back, but possibly for mains only rather than a 3 course meal. December is simply filled to the brim with events and I had the good fortune of heading to Bel Mondo with a group of female engineers for a business lunch. Unfortunately I was too engaged in conversation to remember to take a picture of the dining room, a dark wood affair encased in a traditional Sydney stone building. 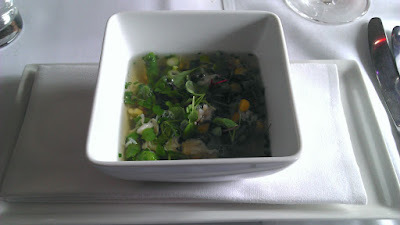 The meal we chose was a 5 Course Degustation, though being a work lunch we opted to order minimal wine rather than drink with every course - I had meetings to go back to after all! They're currently doing a special that makes business lunches very affordable for a much higher class of food than the usual "red wine and steak" affairs one generally eats with clients. 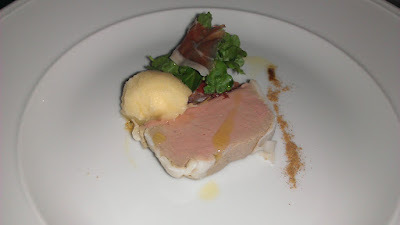 2 courses $55, 3 courses $72, 5 course degustation $95 (with wines $145). I would definitely recommend this as a place to take your valued clients at the end of the year. 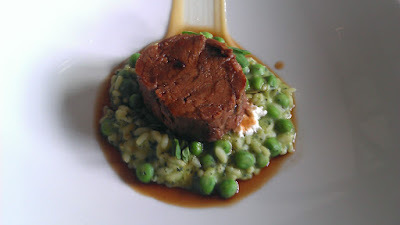 Slow cooked lamb shoulder with pea and mint risotto, caramelised garlic and honey puree. 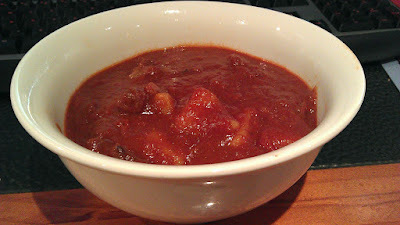 On a Sunday I love to make goulash when I can take the time to really let it simmer and develop flavour. I have discovered the perfect addition to the recipe which really adds depth and richness to the sauce. 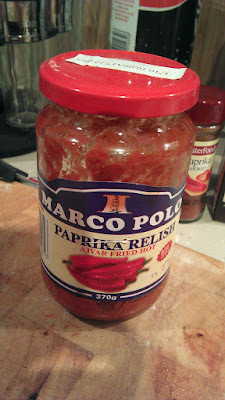 Marco Polo Paprika Relish is almost pure roasted pepper puree - nothing nasty added just oil and salt. I found it in the import aisle of my local supermarket. Try it some time!